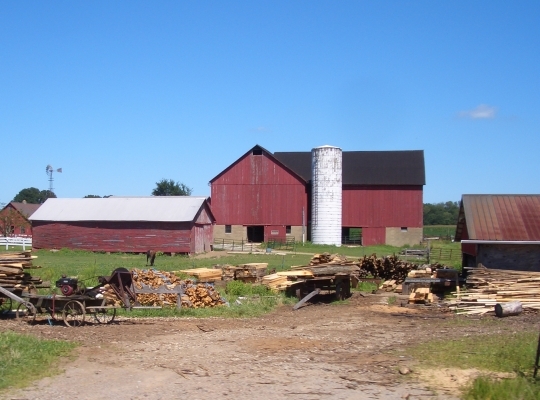 The best known Amish community in Ohio is of course the huge Holmes County settlement, home to around 30,000 Amish. Next would be the Geauga County community, the fourth largest of all Amish settlements, with a little less than half the population of Holmes County. 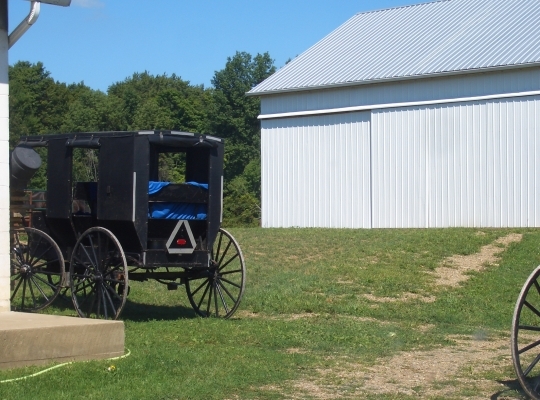 Those may be the most well known Ohio Amish locations, but there are many other Amish settlements scattered across the Buckeye State–over 50 in fact. Not really Richard… just another one of these out of the way Amish communities–businesses of the road as you can see, the produce place had cars coming and going (one was mine) when I dropped in. 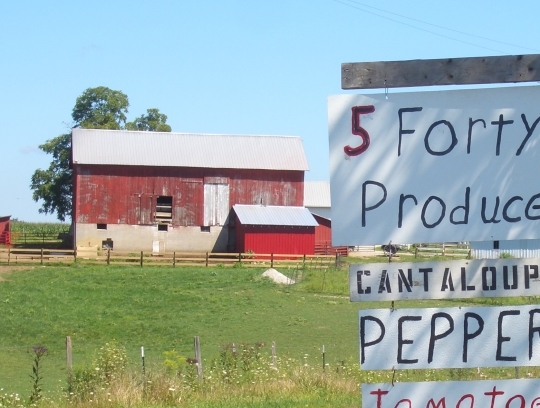 It’s not that big and also relatively close to other Amish communities which attract a lot more visitors, and are more business-oriented. Thank you for the beautiful pictures. I love the house with the porch with the ivy growing on it. Wish it was mine. Really liked those pictures Erik. My favorites are of the carriages. Are the pictures of buggies actually from the Amish in Ashland or from the Old Order Mennonites that live in the area as well? 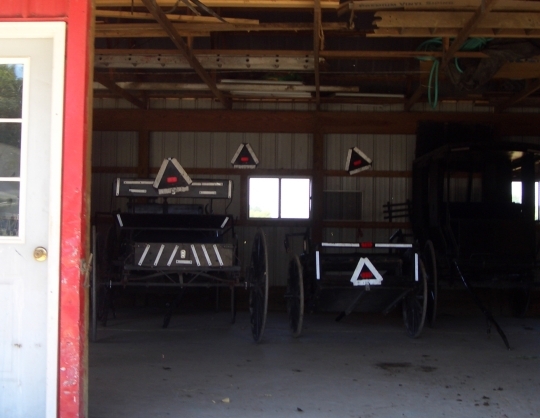 The Amish in Ashland don’t have triangles on their buggies. My uncle lived in Ashland, now deceased, and they didn’t have triangles on their buggies. To answer Lester, I live in Ashland County, and there ARE Amish who use the triangle on their buddies. The Ashland County Swartzentruber Amish don’t use them, however. What color are the slow-moving-vehicle triangles on the pictures? Am I seeing black and white instead of orange? I like the generous amounts of reflective tape strips. Lin this group uses an unusual metallic-silver colored outline for their SMV triangles–not very common at all. Thanks Erik…..I always enjoy your posts, especially pictures! Very good pictures, Erik — I noticed how “clean” and white they keep their places!! Know from what I have read that Amish are very serious about “cleaniness” in some respect, everything looking well kept, etc…..but also have seen in other pictures from other Amish communities, they are not that well-kept or painted, at times. Is this a “district” ruling or what? 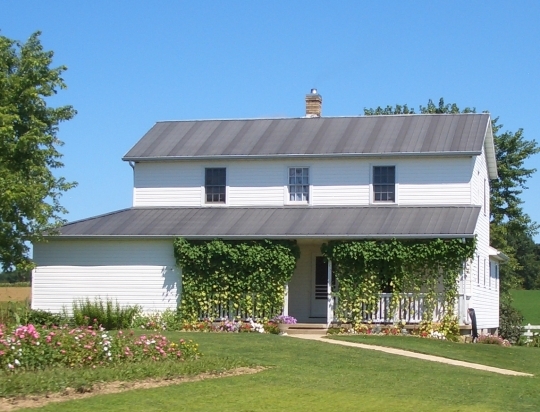 I also noticed the “clean” white look of houses and barns, while in Lancaster, PA areas, too. Very appealing to the eye! The First picture of the house — I have never seen such a “skinny” chimney; lol. Most I see of that height are a little bit wider. Interesting! Hi Sharon, there is simply less emphasis put on aesthetics and appearance of the home in some communities, and yes some groups have stricter material standards which would result in a rougher appearance (metal roofs, dirt drives in some places, etc). I keep marveling at the lack of litter!! Where are the tossed burger bags and cans, the plastic WalMart bags? It seems like everywhere I look where I live, there is litter but I see none in these lovely Amish photos. Living in a small Amish Community in West TN., I make a lot of photo’s of neat things. Yesterday I was at my neighbors (and best friend’s) home, while she was doing laundry. I made some really good pictures of ‘laundry day’. I would be happy to share some of these, if I only knew where to send them? 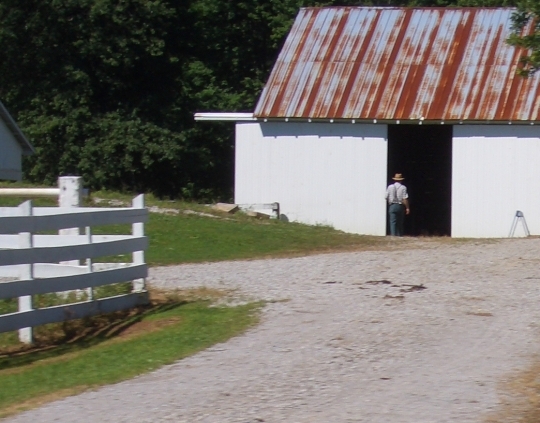 I would LOVE to have you send the pictures of West Tn Amish to me. I don’t want to put the email address on here though……..
Sharon, I have been so busy lately, and had honestly forgotten about the photo’s. I will send some to Eric today, and he can publish whatever he would like. Thanks for the reminder!! Loved the photos of the house and barn. The flowers and ivy around the house looks so nice and inviting. Must be cool on that porch with the shade provided by the ivy! Perfect for sitting outside for a bit to relax. As I grow older and more disabled to keep up my home site cleaned up, I enjoy seeing how neat and clean the ground and buildings are being kept. Eric, I read every day the articles you print and can only wish I could travel with you to enjoy the people and places you visit. Thanks Leon, that is kind of you. I hope this is the next best thing to being there. I’m always surprised to see how many Amish buildings wear their chimneys on the outside of the house. Chimneys work and draw much better when they are in a warm place, especially non-insulated masonry ones such as those pictured here, or so I’m told. 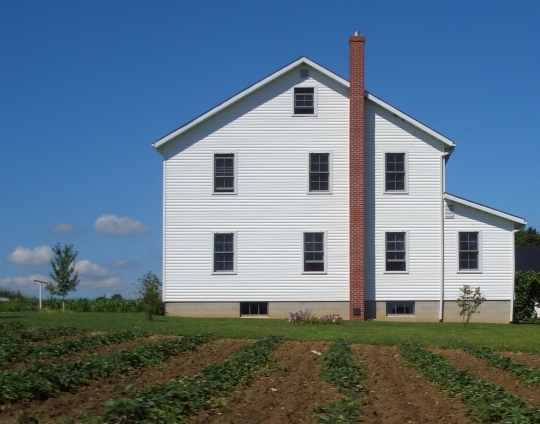 Given that the Amish generally burn much more wood and are more knowledgeable than the English on such things, it makes me wonder if everything I was ever told about the undesirability of an external chimney was not really all that true. now whats an externial chimney? What people are calling ‘ivy’ are actually morning glories. In the case of the last picture, the flowers are yellow. I have also seen blues, reds, and violets on Amish porches. While pretty, I am not too sure why Amish grow them. They end up in the farm fields messing up the crops there as a especially noxious weed. Amish call them all morning glories, so that is what I called them. It makes better sense now as the the ones by the houses were always from seed and the ones in the field were volunteer. They are a bad weed in corn. Ah, Lance, you beat me to it! I thought they were morning glories but didn’t know the draw back of them in the fields. I have the prettiest picture of an Amish couple sitting in their arbor covered with blue morning glories. My former AMish friend said his mom truly always had one of those floors so clean you could eat off-non stop cleaning. Another former Amish couple who were on a documentary, (and still plain dressed as Christians) the woman wouldn’t stop mopping her floor while they filmed her talking! I recently read a book by an author who lives there. He has the rare treat of being a close firnd with a Swartzengruber family. I’m sure you know which one I’m thinking of. I plan to vidit there this summer. Hi Jeff I think you’re referring to Plain Secrets by Joe Mackall. Quite an interesting book. That be it. Great book. As always Erik, you provide us with great pictures! I definately like the last one best, but they are all worth multiple looks. 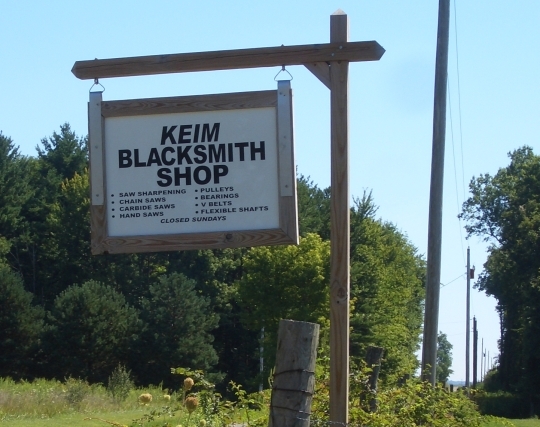 Joe Keim of MAP Ministries grew up Amish in Ashland county, wonder if that Keim Blacksmith shop is someone in his family? I believe some of his siblings are still Amish. I agree with Leon—wishing I could visit these places! That’s why I love these photos—viewing them is like taking an instant mini-vacation. The sky is so BLUE in that first shot (my favorite color, too). I also like the thoughtful overhang that shades the schoolhouse windows(good planning!). To “Meandering” who asked how to pronounce Geauga….Having lived just south of Geauga Co. in my childhood we always pronounced it, “Jaw-ga”. Thanks, Mary, now I know! Pronunciations of names of places aren’t necessarily easy to look up. I’m actually a bit surprised the “low profile” slow moving vehicle signs are in gray tape. I guess I always assumed when reading about these fights, the compromise was to use Scotchlite 680 or it’s equivalent — something that’s black except when you shine a light directly on it and reflects back at the source of the light. We’ve used that for “pinstripes” on our ambulances for over 20 years (and we also have larger reflective striping in other colors). It would be certainly be less noticeable in the day then what they’re using, while just as bright at night. Of course, greater daytime visibility is part of the reason for SMVs in the first place! I love the house photos. 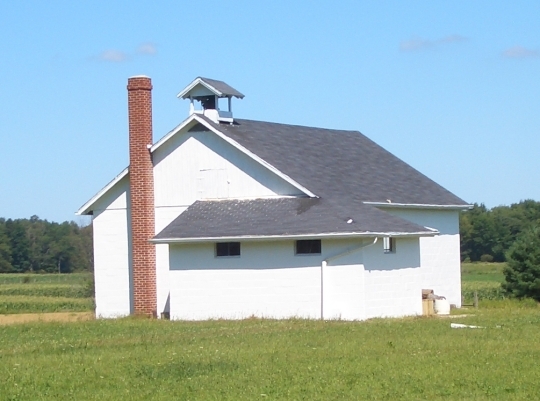 But my favorite is the schoolhouse photo. Thanks for sharing these. Of all the great things you share, I do love the pictures you post most of all. I love the last one, especially! 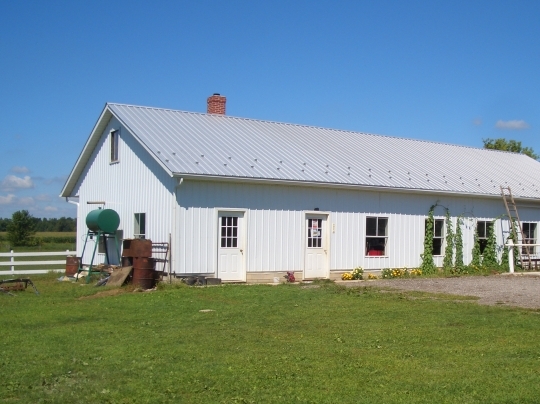 Loved all these photos of the Amish homes, buggies and barns. They always look so well kept. And the last photo is really, really a nice one. Thanks for sharing your photo’s with us. It lets have a glimpse into the Amish world.